So you’ve decided to go with an oval-cut diamond in your engagement ring — beautiful choice! 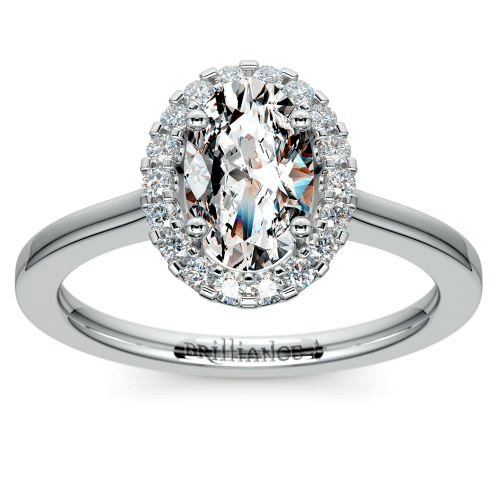 This twist on the traditional round brilliant diamond is renowned for its fire, brilliance, and sparkle. What’s more, it’s elongated oval shape results in a stone with greater surface area that looks particularly stunning on women with larger hands or longer fingers. Now that you’ve settled on the oval cut, you’ll want to be sure to select the perfect setting for it. Oval cut diamonds work in a variety of beautiful settings, so long as you tailor it to the shape and demands of the center stone. The solitaire is perhaps the most popular oval ring setting because it so beautifully allows the unique shape and brilliance of the center stone to stand out. Amber Rose rocked a stunning oval cut engagement ring from Wiz Khalifa, and her solitaire setting let the diamond’s jaw-dropping carat weight do all the talking. 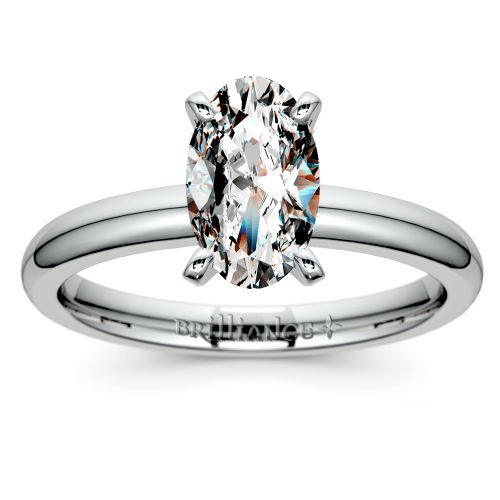 Even if you can’t afford a celebrity-sized stone, the solitaire setting can be an elegant way to showcase your diamond. You could vary the color in the band to add a glamorous, chic twist on your look. Rose gold works particularly well with oval cut diamonds. 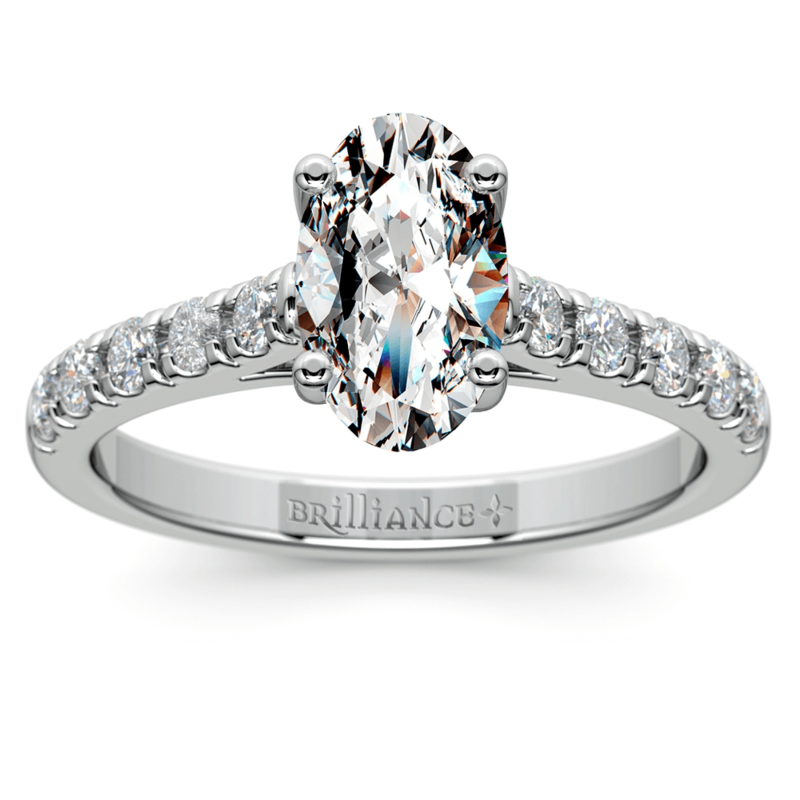 Consider adding a splash of color to make your ring stand out while keeping it classy in an elegant solitaire setting. A halo setting is another popular choice for oval cut rings. Most famously, a halo of diamonds surrounds the central sapphire in the iconic engagement ring worn by Princess Diana and Kate Middleton. The fire and brilliance of an oval cut are amplified by the surrounding bling of a halo setting, and the halo is a wonderful way to enhance your ring if a larger center stone is outside of your budget. If you want something a little more unexpected, there’s a myriad of options within the halo setting. Instead of diamonds, create a halo of gemstones, such as rubies or sapphires, or choose a halo setting on a diamond encrusted split shank band to amplify the bling even more. The halo setting is the perfect choice for the bride-to-be looking for maximum sparkle. However, round diamonds can be beautiful with oval cut stones if they are smaller and part of a more completely encrusted band. Oval rings look lovely on diamond-studded bands, like a scallop pave or a pave ring with a trellis style setting. Celebrities like Blake Lively and Heidi Klum put these styles in the spotlight, and they have been all the rage for people looking for oval ring settings. If you are looking for something similar to the celebrity style stunners, opt for a three sided pave or three row pave look. It’s less common to see an oval ring setting with prominent side stones, but if you choose complementary cuts, it can be a rare thing of beauty. Salma Hayek turned heads with her oval-cut ring flanked by two trillion cut diamonds, and you can recreate this look to stunning effect. Baguette diamonds also make beautiful side stones. Avoid a setting with large round stones on the side, as their shape clashes with the elongated symmetry of the oval shape, but half moon diamonds are a good compromise if you prefer a rounded look. Since the oval cut wasn’t developed until the 1960s, it may seem counter-intuitive to select an antique setting for an oval stone. 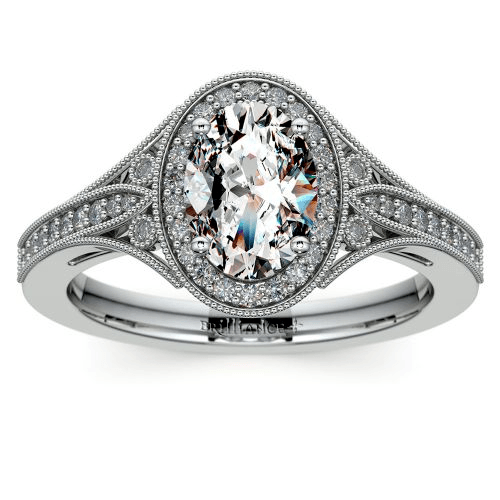 But there are many beautiful vintage inspired settings that will complement an oval diamond perfectly. The elongated shapes and symmetry of the Edwardian setting lend a fluidity and grace to the more modern oval cut stone. 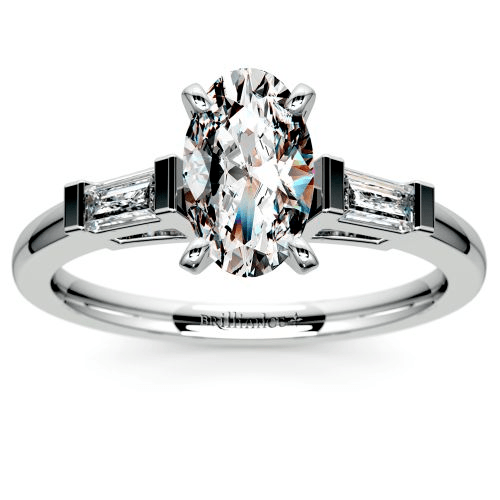 Whereas the Art Deco halo setting is just a more intricate take on the halo setting that suits oval stones so well. If you choose an antique setting, you’re more likely to have a truly one-of-a-kind ring since so few people opt for this setting option with an oval diamond. It’s the perfect way to blend the timeless elegance of the past with modern elegance and show the world that you alone define your style. Take, for instance, Adam Levine’s wife Behati Prinsloo. Her antique raised halo setting turns its oval stone on its side and places it in an entirely unique setting while maintaining an ageless grace. No matter what setting you choose, an oval ring is a beautiful and elegant choice for an engagement ring. Decide which setting best fits your look and enjoy the ring of your dreams.